Another great bookbinding book about making books with recycled and repurposed materials. This one is from Lark and it's called Eco Books, by Terry Taylor. I contributed some content to this book. It contains a total of 40 eco-book-making projects so it'll be a fun book to have if you like using different materials! 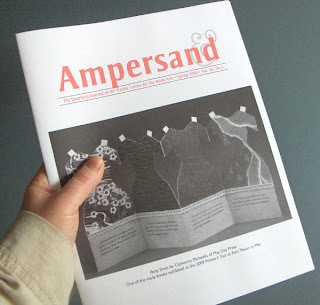 I also just got the most recent copy of Ampersand in my mailbox. There are always lots of great articles and how-tos in this journal so it's fun to get. This is the quarterly journal of the Pacific Center for the Book Arts and this particular issue has an article I wrote about selling handmade books online. I can't wait to get my copy of Eco Books. I have a project in it too. :D I'm eager to see all the other projects! oh good for you! and i agree, it will be great to see all these great projects. Rhonda, congrats on your article in Ampersand! I read it with interest. P.S. 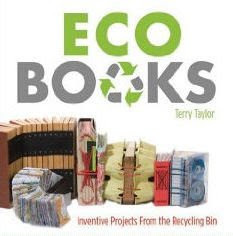 Lark Books, which publishes Eco Books, and Terry Taylor, are in my (now) hometown of Asheville, NC! Yeah, I noticed they were based in Asheville! Lucky you to be in such a great town, I need to go there someday - maybe I'll make it to the Bookworks sometime (I'll be sure to let you know! ).